From around October onwards, Christmas novels are everywhere. They are big business these days. Twitter has heaps of photos of Christmassy covers and book bloggers feature lists of festive reading. But for me, the best Christmas reads are murder mysteries. 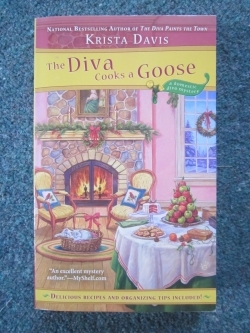 One of my favourites is The Diva Cooks a Goose by US cosy crime author Krista Davis. What makes so good is the re-gifting of the instrument of the murder. Re-gifting? Oh, you know what that is, even if you you call it something else. It's when someone gives you a present you don't want, so you wrap it up again and pass it on to someone else. And in The Diva Cooks a Goose, that's what happens to the the item that is used in the killing. The Diva books are always clever and amusing, but this one is particularly funny. This Thursday would have been my late mum's birthday. Obviously I was thinking about her and I remembered her habit of re-gifting. She was the world's worst. And I mean 'worst' in both senses. Worst as in prolific; but also worst as in... well, she wasn't awfully good at it, especially when you consider how experienced she was. Let me give you an example. There was one birthday when I spent ages choosing a purfume for her. It wasn't in an atomiser; it was a pretty little pot of purfumed cream, so as well as having a lovely scent, it was also unusual, and I thought it would appeal to her. Her birthday came. She unwrapped it and was delighted. She dabbed some on and gave me the pot to try it too. She wore it the next day as well, and that afternoon I set off on my 180-mile drive home, thinking I had pleased her. Ha! The following year, guess what I got for my birthday. Because that was the other thing about Mum's re-gifting. Not only was it prolific and full of mistakes, it was also shameless. Bad enough passing on a present you haven't opened, but to pass on something that has been opened and tried...! In fairness, I ought to say that not all the presents she gave were re-gifts. You could always tell when she'd chosen it herself because either it would be spectacularly awful (too awful to pass on to another recipient) or else so spot-on perfect and wonderful it took your breath away. A woman of extremes, my mother. How about you? What are your favourite festive reads? What were the best/worst pressies you ever had? And - dare I ask - have you ever been embroiled in a re-gifting fiasco? Do tell! PS Heidi, if you're reading this, there is definitely one non-murder-mystery Christmas book I'll be reading next Christmas. Keep writing! Thanks for sharing details of your auntie's re-gifting, Jen. She sounds worse than my mum. You did make me chuckle. Thanks also for the book recommendation. I'm off to Amazon now to look for it. My favourite festive read has to be 'The Charm Bracelet' by Melissa Hill. It's a magical, feel-good story set in New York City at Christmas time. As for re-gifting, you've given me a much-needed laugh today, Susanna. I had an eccentric great-aunt who was a re-gifter to rival your mum. In auntie's case, though, she 'gifted' so-called family heirlooms, usually broken. As a teenager I received part of some beading from a dress worn by a family member who died young (the latter was emphasised), as well as a meat platter that had been broken and stapled together! I've occasionally re-gifted presents (e.g. peanut brittle because I'm allergic to peanuts) but I keep a list of original givers! I'm glad the story raised a smile, Jan. If nothing else, I think my post may have put some people off re-gifting! Your post made me smile, Sue. 😀 Your mum sounded a real character and I'm trying to imagine your face when you opened the re-cycled perfume pot! I haven't ever re-gifted anything but if I did, I think I'd have to keep a book where I wrote down what I'd given to whom!! Glad you enjoyed the blog, Heidi. I'm delighted to hear that the Christmas novel is progressing well. The Cherry Tree Cafe is a lovely book, so I'm looking forward to experiencing that feel-good feeling all over again with added jingle-bells. Thanks so much for dropping by.